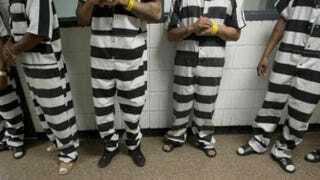 Prisoners at Michigan’s Saginaw County Jail are having their orange jumpsuits traded in for black-and-white striped duds. Orange is the old prison color. At least it is now at one Michigan prison that changed the prisoner garb from orange to black-and-white stripes after the success of the Netflix show Orange Is the New Black. "I see a lot of people wearing all orange, and they think it's cool. And some people even put 'Property of the Saginaw County Jail' on the back of it," Saginaw County Sheriff William Federspiel told MLive.com. "I've seen that. It's like, 'What are you doing? Really?' "
Federspiel told MLive.com that he believes the success of the show has made the all-orange jumpsuit a kind of fashion trend for the public that is a bit jarring. He said he was also concerned that if the trend became too popular, it would be hard to tell actual inmates from those just wanting to sport a prison jumpsuit, if a prisoner happened to make his way beyond the prison walls. "We decided that the black-and-white stripes would be the best way to go because it signifies 'jail inmate,' and I don't see people out there wanting to wear black-and-white stripes." "When the lines get blurred between the culture outside the jail and the culture within the jail," Federspiel told MLive.com, "I have to do something to redefine those boundaries, because they've been blurred far too often in public culture … I don't want them to not be easy to spot. That's scary." The uniforms were included in the prison budget and cost roughly $11.73 per suit. Federspiel told MLive.com that as of now, not all inmates have been converted to the black-and-white striped jumpsuit, but he hopes that transition can happen before the end of the year. As for the prisoners who aren't fond of the felon fashion faux pas? "Too bad. Don't come to jail," Federspiel said.